So the question becomes … what is the issue? Our lifestyle choices lead our body to inflammation. 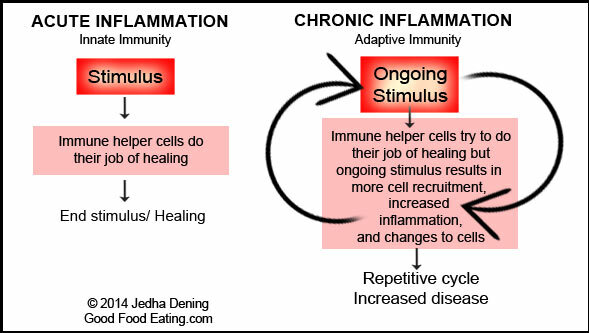 Inflammation is the immune system’s response to a stimulus that is viewed as foreign or toxic to our body. We get bitten by a mosquito and our body swells up – inflammation. We hit our elbow on the kitchen counter and cry out – inflammation. Those two examples are acute and will dissipate as our body completes the healing process. Does this same process occur when we put something inside our body that is “foreign or toxic?” The answer is yes. And the fight is more intense than we may realize … because it is chronic. Chronic inflammation – this means long-term inflammation, which can last for several months and even years. Our immune system is disrupted. We are putting unnecessary stress on our system and causing it to be in constant defense. And with this defense we are causing our our body to launch a targeted strike on our own cells, tissues, or other harmless material. Why is our body doing this? Because of what we choose to consume. Over the course of these blog posts we’ll look at the chronic inflammatory response that is plaguing our bodies due to our lifestyle choices. We’ll also present small changes that we can make in our daily habits to promote a healthy relationship between our immune system and the rest of our body. With This In Our Diet – A wide variety of organic produce (ideally local and seasonal). Frozen works! Next post17.01.05 – Inflamed: Welcome to your Microbiome!